Restoring the exterior involved chemically stripping epoxy-based paint from the bricks and stucco. 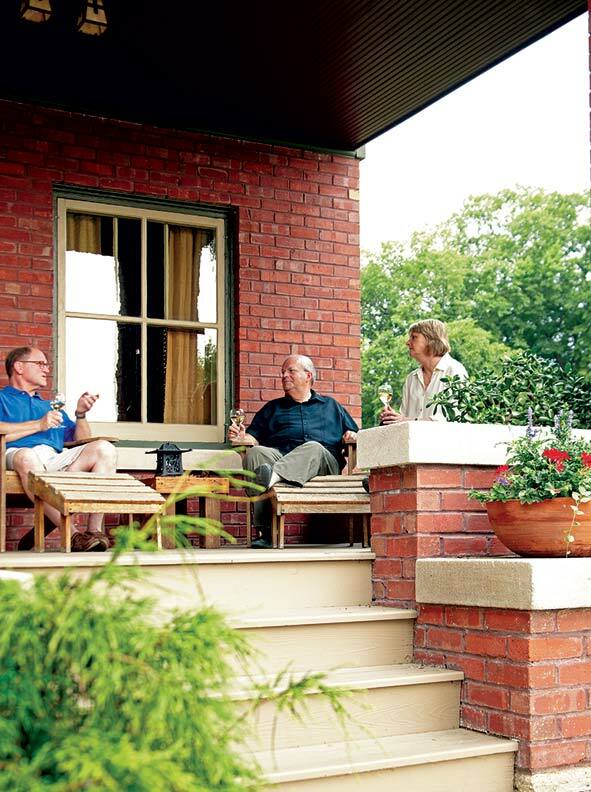 An active participant in local preservation efforts since the 1970s and a big believer in preservation as a revitalization tool, Gary has not only served as president of the Rockford Preservation Commission, but has also personally restored a number of buildings in town, including a 1905 Craftsman worker’s cottage that now serves as the office for his used car dealership. 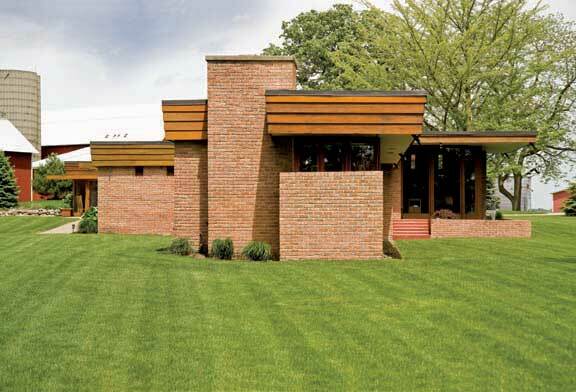 His latest project—undertaken with the help of friends and restoration specialists Kurt and Sarah Bell—is his own home, a large brick and stucco residence attributed to architect Lawrence Buck, who worked for Frank Lloyd Wright in Chicago before opening his own practice in Rockford in 1903. Sarah Bell hand-painted the geometric frieze in the front hall, which is based on a vintage design. As for the home’s slate roof, a large section of it had been removed and replaced with composite shingles, which had started to leak. 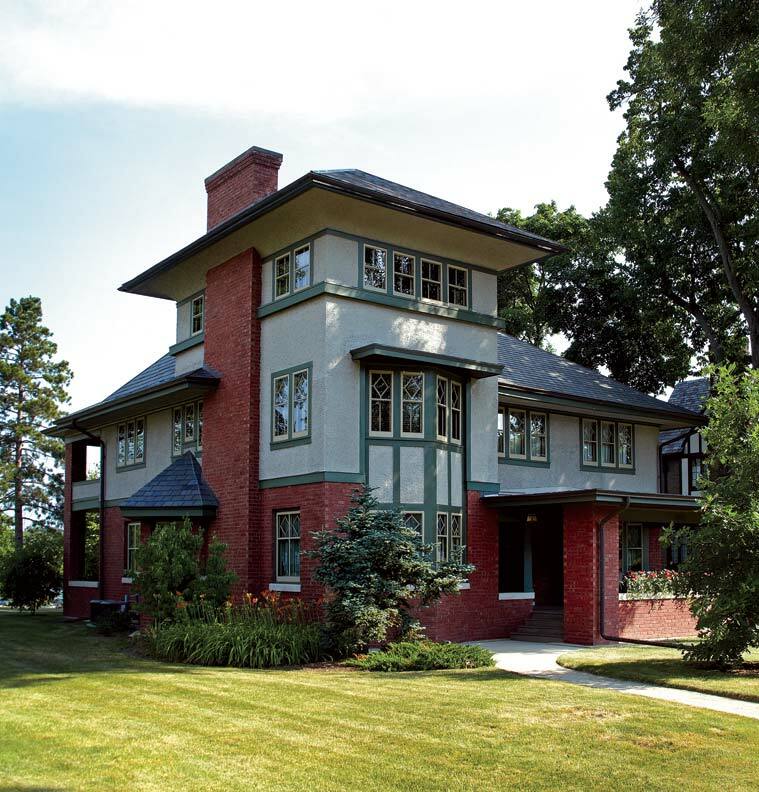 The original copper flashing, gutters, and downspouts had long since disappeared. Gary caught a lucky break when Robert Raleigh, Jr., the owner of Renaissance Roofing in nearby Belvidere, Illinois, noticed the slate that capped the house and gave him a call. “He does a lot of salvage and had just bought a 200-year-old roof off an Army building on Long Island that was the same color as mine. Because the slate he had was heavier than mine, he replaced the 2x4 support timbers in the attic with 2x8s and replaced 2x6 rafters with 2x10s.” In addition, Robert installed new copper flashing, gutters, and downspouts. 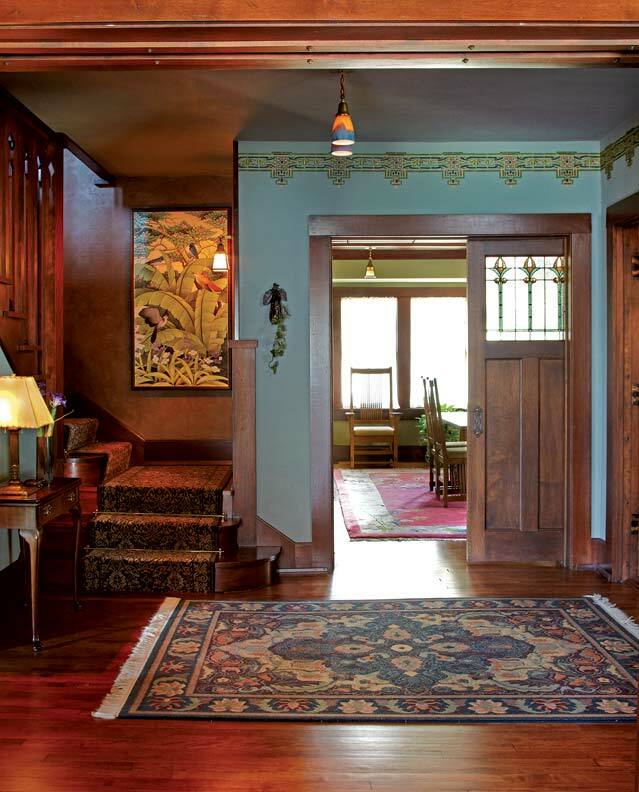 While the home retained much of its original detail, including Victorian doorknobs, extensive millwork, and a handsome fireplace with Seneca quarry tile and an inglenook, other decorative features had been lost or compromised. The original lighting fixtures had been chucked in favor of cheap replacements (some not even intended for interior use), and just a few pieces of leaded glass remained in the dining room’s built-in cabinet. The home’s parlors have been returned to their original appearance, with gleaming woodwork and appropriate light fixtures. The fireplace is faced with distinctive Seneca quarry tile. An acquaintance introduced Gary to the daughter of a previous owner, who produced family photographs from the 1950s; they revealed that the cabinet’s upper portion and windows in the dining room’s pocket doors had once sported leaded glass with a stylized floral motif. While these were removed from the property when it changed hands in the 1980s, through this new contact, Gary was able to track down the person who had bought the original panels, strike a deal, and restore them to their original locations. 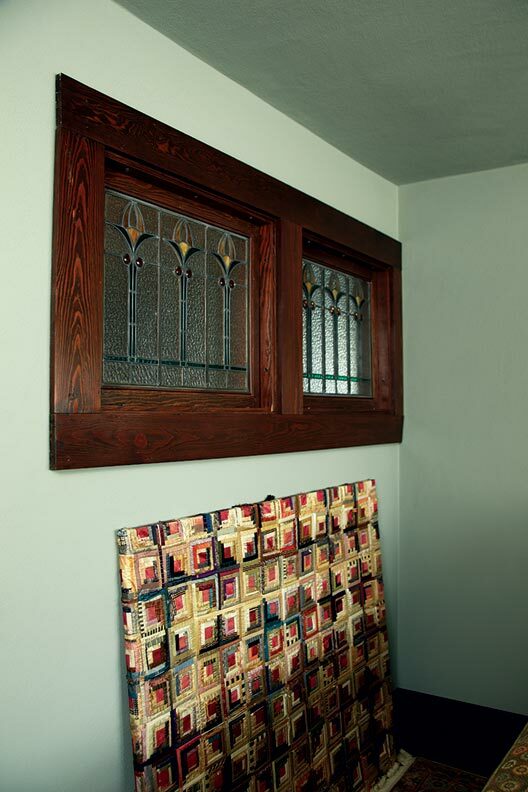 Gary then had local glass artist Frank Houtkamp re-create the design for the swinging door to the kitchen. An additional touch true to the spirit of the home is Sarah Bell’s decorative painting in the front hall: a period-appropriate geometric frieze she discovered in a book called Authentic Stencil Patterns: 1890-1930. Although undated, the design—done in green, red, yellow, and gold—suggests a transition from the Victorian era to Mission style, she says. 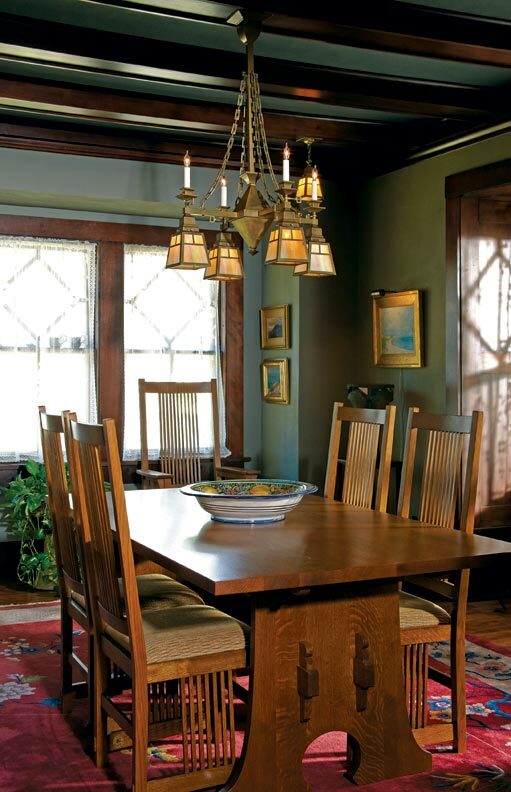 In the dining room, a reproduction gasolier-style fixture hangs over the Stickley dining-room table. 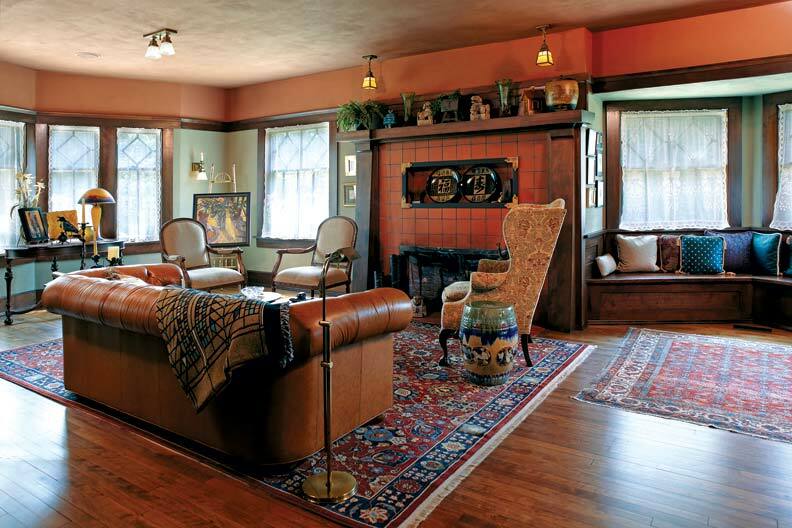 While the parlors and dining room have been returned to their original appearance, Gary did allow himself one dramatic intervention, reconfiguring two bedrooms into a master bedroom and den, then breaking through the ceiling to create a library in the third-floor space, which had been dedicated to servant use when the house was built. Accessed by a new staircase and open to the den below, the library sits in the tower that gives the residence its distinctive profile. This contemporary arrangement is made sympathetic to the spirit of the house with a balustrade that matches the stacked arrow design of the spindles in the home’s main staircase. 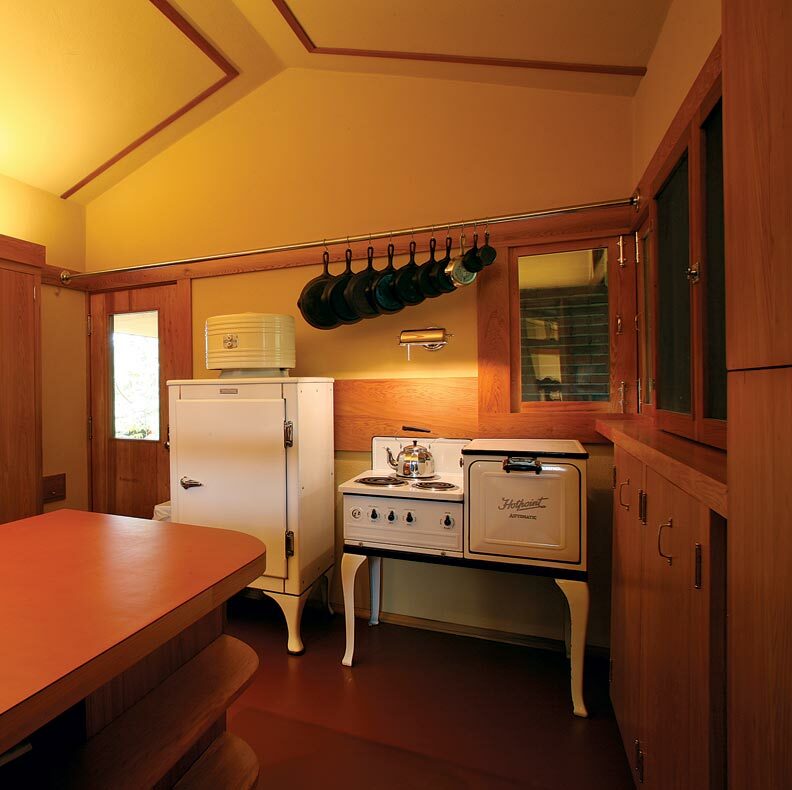 The original kitchen had been given an Art Moderne makeover in 1944, with steel cabinets and linoleum countertops—and like the rest of the house, it was in utter disrepair. 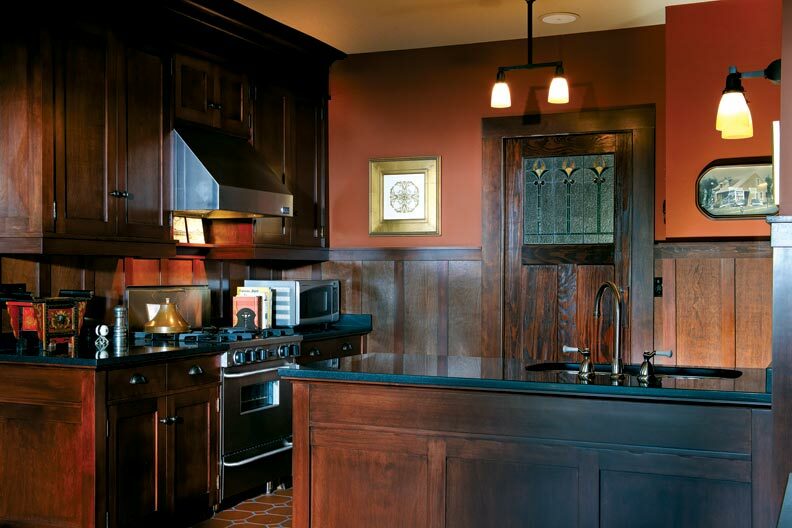 Gary replaced the steel cabinets with ones made from cherry-stained ash, along with a terra-cotta floor and honed black granite countertops. 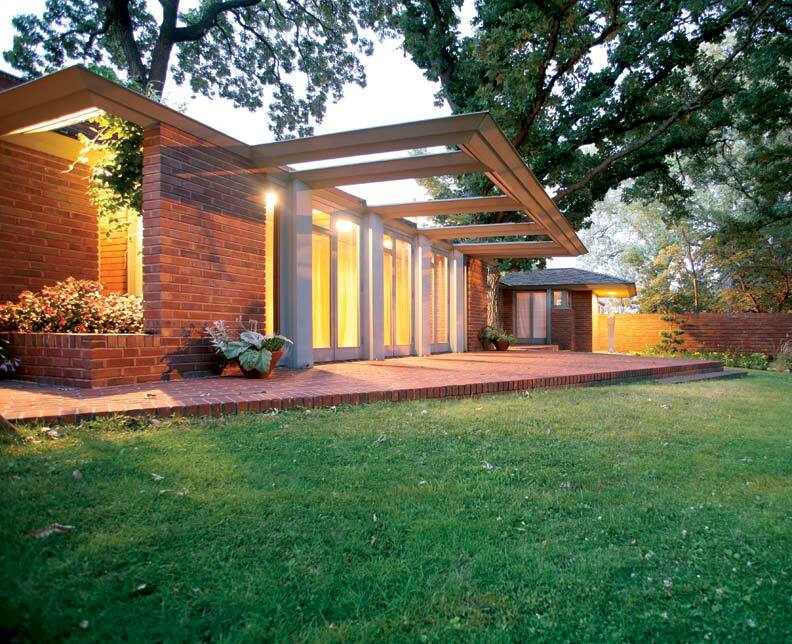 A large plate glass window installed in the ’40s was replaced with French doors, which lead to a terrace atop the garage Gary added to the rear of the house. Constructed from bricks salvaged from a decrepit detached garage on the property, the addition’s style matches that of the 1908 residence.